Los Angeles - The Dancing Star Foundation (Los Angeles, CA) and Zorba Press (Ithaca, NY) have just announced the online/worldwide release of God's Country: The New Zealand Factor by Michael Charles Tobias and Jane Gray Morrison, Introduction by Ingrid Newkirk, President of PETA, People For The Ethical Treatment of Animals. The book, 602 pages and more than 850 photographs, is available online as a free PDF download. The book - a mixture of Utopian prose and deeply personal supposition - provides an expansive analysis of ecological trends of the first decade of the 21st century, using New Zealand as an important paradigm for positive global change. Far more than one more treatise on environmental change, God's Country explores the many complex issues affecting the local, regional and global ecosystems upon which all life depends and against which the human conscience is heartbreakingly at odds. Tobias and Morrison profile this frequent collision of ethical values and personal, political and fiscal interests at every social level: from the individual choice to consume, or not to consume, animal products; animal rights, animal welfare and animal protectionist organizations; biomedical interests and factory farming; and many of the NGOs and governments around the globe in earnest disarray over the myriad causes and consequences of climate change. The Authors note that the complexity of the issues explored, compounded by inherent cultural differences which further exacerbate global dissension and disengagement, while daunting, are not insurmountable and, indeed, underscore the interconnectedness of a world at risk. And while this 602-page treatise is, according to the Authors and Publisher, no more than a large amalgamation of Opinions and Subjective Surmise, the Authors cite time again their sincere beliefs that New Zealand is a nation optimally situated to foment a sea-change in reassessing the human, animal, environment connection… a nation in the throes of contradiction, to be sure, but a nation where thoughtful public dialogue can drive encouraging change towards a more compassionate future. Consider the New Zealand paradox: with its thousands of protected, covenanted areas and fourteen remarkable national parks, New Zealand has capitalized brilliantly on "eco-tourism." Yet it has also been described as one of the world's "capitals of extinction" (along with many other regions and nations) due to the tragic loss of species, principally bird species (avifauna). In addition, New Zealand's tranquil image of picture postcard scenery, betrays a less talked-about reality, namely, the slaughter of farm animals for the breakfast, lunch and dinner; a situation that exists in every country. The very public "dialogue of conscience" in New Zealand, Tobias and Morrison posit, can serve as an expedient for change in individual choices and industrial change, alike. Calling upon both historical and contemporary sources, the authors paint both wrenching and Quixotic portraits as they examine animal suffering and habitat degradation in New Zealand and throughout the world. But beyond carefully chronicling the global crisis in these vital areas, they offer a practicable blueprint for change, enshrining a new methodology for examining the pain and cruelty meted out by humans to other species - a veritable cartography they call "pain points." "New Zealand," Tobias and Morrison observe, "has the profound opportunity to reinvent her future in every environmentally-vulnerable sector, most notably agriculture for domestic consumption and export." In their words, "New Zealand is a country capable of anything: a new world, a revivified tenable roadmap for compassion and pragmatic idealism that could ultimately work anywhere, in every human community." The message in God's Country: The New Zealand Factor is one of stark realism tempered by compassion and hope. In her introduction to the book, Ingrid Newkirk, President of People for the Ethical Treatment of Animals (PETA) concludes, "Michael Tobias and Jane Gray Morrison have a dream. The beauty of their dream is not only in the imagining, it is in knowing that it could come true. What it would take to make that happen is for a relatively small number of human beings to decide that the world need not spin out of control and that they themselves are powerful enough to help turn what is now a dream into reality, or at least move us all closer to it." 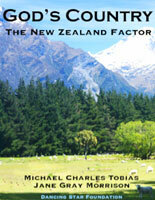 Free online access to "God's Country: The New Zealand Factor" is available at www.dancingstarfoundation.org and http://www.zorba.us/?page_id=1260. "The quality of mercy is not strain'd," Shakespeare famously wrote in "The Merchant of Venice". "It blesseth him that gives and him that takes." This "quality" is woven throughout the myriad issues confronting the reader of God's Country, a work that both quantifies and qualifies many of the ecological trends of the first decade of the 21st century. Today's environmental literature is vast. One who specializes on the genetics of brown bears may know next to nothing about the migration of hummingbirds between Florida and the Yucatan. Nor does a zoologist necessarily have the time or knowhow to follow the ongoing biomedical or ethical discussions engaging tens-of-thousands of well-meaning individuals attempting to improve standards of humanity that might yet enjoy a universal recognition. Issues pertaining to poverty alleviation and the countless forms of stress we humans impose on the local, regional and global ecosystems that give us our sole sustenance are often conceptually at odds. There are those who still believe that humans are a superior species, and those who do not; that the mass killing of animals is ordained by evolution, for the benefit of humans, versus that growing rallying cry of compassion which utterly undermines this former piece of expedient illogic with a greater wisdom, namely the interdependency of all life forms and the very fact of a human conscience, capable of extending an olive branch, of expanding the circle of compassion to other individuals of other species all around us. It used to be that critics of the environmental movement would say that ecologists are good at illuminating problems, but rarely proffer solutions. Today, problems are so complex, or veiled within other problems, that the very interconnectedness of a world at risk and the human condition are inseparable. Not every problem can be solved, or certainly not quickly or easily, whether an oil-spill in the Gulf of Mexico, or a devastating earthquake and tsunami in northeastern Japan. But humans have a heart and a brain and what would appear to be an unlimited capacity for love. However, detractors have good evidence for rendering a cynical commentary on our age. Whether they be the community activists, Audubon Society and Sierra Club environmentalists who were outraged over the Los Angeles County crews that felled 200 oaks and sycamores in the Arcadia highlands of Southern California in January of 2011 to make way for a massive dredging initiative beneath the Santa Anita Dam, or Islamic animal rights proponents who are indignant and traumatized by the annual holiday known as Id al-Adha, which sees millions of animals slaughtered in what was described by a New York Times article as "a joyful time with a charitable theme." ("In Egypt, an Activist Relies on Islam to Fight For Animal Rights," by Robert F. Worth, November 22, 2010, p. A8) There is tremendous agitation and widely differing opinions regarding all things environmental and animal-related throughout the world. The planet, and every individual of every species, are challenged as never before: peace or violence are stark choices which every human being who feels and thinks and imagines must grapple with in their daily lives: at the job, around the dinner table, with every self-willed action, be it of consumption, intention, or inadvertent participation. We are all actors on the world-stage, as Shakespeare, and so many other great bards have reminded us. Some take their acting seriously to the point that it is not acting, it is their identity and they hold firm to their convictions in life, as on the stage. But it takes courage and pertinacity to face up to the indelicacies and tragedies; a history of murders and the continuation of what has been termed "the slaughter of the innocent," the title of a book published by Civis Publications in 1982 and written by the famed anti-vivisectionist, Hans Ruesch. The book, also known as Naked Empress or The Great Medical Fraud, helped re-galvanize animal rights movements in Europe and America in much the manner that Romantic poet Percy Shelley's "A Vindication of Natural Diet" (1813) helped fortify the resolve of such giants of world change as Henry David Thoreau, Tolstoy, Henry Salt and Mahatma Gandhi. In God's Country: The New Zealand Factor, Michael Charles Tobias and Jane Gray Morrison have adopted the nation of New Zealand as one representative prospect for idealizing a sea-change with facts, details and personal experiences that help us to gain a larger set of perspectives on the environmental complexities and debates involved in the proactive, biologically-enriching transformation of any nation or region or set of diverse communities throughout the world. Extrapolating from both historical and contemporary sources, Tobias and Morrison paint both sobering and idealistic portraits within as they survey countless environmental juggernauts, as well as blueprints for ameliorating the current regime of animal suffering and habitat degradation throughout the world. The Authors' speculations and opinions converge on both the many poignancies of received bio-geographical wisdom, as well as less obvious lessons from the history of the natural sciences and eco-psychology. The Authors examine global contradictions in every direction. A devastated nation like Haiti, with less than 2% of her original habitat remaining, might seem lost, a human population of 9.7 million people, 80% of whom are trapped below the poverty line and mothers continuing to have the highest birth rate in the Western world, or 3.5 children per woman. Over 316,000 people died in the Haitian earthquake of January 13, 2010. A year later, the country continues to endure significant chaos and human suffering, just as Japan faces a $100 billion+ financial hit to its systems, and the loss of thousands of lives, the human epicenter being the city of Sendai, famed as "The City of Trees". At the same time, when all hope seems utterly compromised for Haiti's near future, scientists recently re-discovered six species of amphibians in the "remote" Haitian mountains of de la Hotte and de la Selle, one of those species being a frog not seen for over twenty years and named after Mozart. Hope floats in unexpected ways. In tiny European San Marino, a nation of 6,000 hectares, and approximately 31,000 human residents (just slightly more than four people per acre) the same percentage of forest cover as Haiti, namely 2%, prevails; yet per capita income of $55,678 exceeds Haiti's ($480.) by nearly 116 times. Nine non-human mammals (excluding pets) cohabit San Marino's 144,000 acres with its low human population: the Bank Vole, the Wood Mouse, the Mediterranean Mole, Schreiber's Long-fingered Bat, Greater Horseshoe Bat, Lesser Horseshoe Bat, Red Fox, Least Weasel, and European Otter. (IUCN Red List, Smithsonian Institution, and University of Michigan data). Hundreds of bird species and over 2,000 plant species also call San Marino home. This nation, with the world's oldest Constitution (1600) might seem like something of a paradise, the way New Zealand does for many who live there or have visited or long to do so; notwithstanding the seismic devastation to Christchurch and environs, the country's second largest city, on the 22nd of February, 2011. Yet, Haiti, like San Marino, and not unlike New Zealand, actually offers what has been described as "a botanist's and bird watcher's paradise." (See "Can Haiti dream of ecotourism?" by one of Haiti's premier conservationists, Paul Paryski, who was instrumental in establishing the country's national park system (http://kiskeya-alternative.org/publica/diversos/haiti-dream-ecotourism.html). New Zealand equally promotes her eco-tourism with the famed "clean, green" mantra long espoused by a nation that can proudly look to her thousands of protected areas, as well as 14 remarkable national parks. At the same time, New Zealand suffers from many of the same ecological woes discernible in most countries. For all of her magic, beauty, rich bio-cultural values and remarkable conservation gains, the nation has also been described as one of the world's "capitals of extinction," principally for avifauna doomed by humanity's handiwork and the tragic introduction of non-native mammalian predators. (See www.hotposts-thefilm.org). With the Authors' Foreword and Preface, twelve chapters and a Coda, God's Country: The New Zealand Factor examines what it would take for "nations such as New Zealand to help save the world." The Authors clarify such "wishful thinking" with a pragmatic set of considerations - some more difficult to enact than others, to be sure - that could, if deemed logical by even a small minority of advocates, help accelerate long-held beliefs that can all contribute to a safer, more loving humanity; and which, by turns, might liberate countless fellow beings marooned on the Earth and suffering as a result of our careless indifference as a species. The Authors are convinced that New Zealand - like few countries in the world - could accomplish a revolutionary head-start towards a nearly cruelty-free, totally sustainable way of life. After all, with a population only 10% more than that of the United States at the time of the creation of America's Constitution (1787, ratified two years later, a new nation with 3.9 million citizens), New Zealand has the profound opportunity, say the Authors, to reinvent her future in every environmentally-vulnerable sector, most noticeably agriculture for domestic consumption and export. New Zealand is capable of anything: a new world, a revivified tenable roadmap for compassion and pragmatic idealism that could ultimately work everywhere, in every human community. Looking at issues and large moral/technical domains such as the nature of "Faith in an Age of Ecology," "Sustainability Challenges in Paradise," the complexities and tensions of morality and of hope, the history of vegetarianism and meat-eating, the "industrial fate of animals" and many other seemingly intractable arenas of deep concern and endless opinion, Tobias and Morrison take case studies, specific areas for reformation, and examine both the science, the social sciences, public polls and a wide body of existing opinion and editorializing that so engulf every geopolitical and economic argument pertinent to agro-ecology, sustainable agriculture, supply and demand, depreciation of natural capital, biodiversity loss, habitat destruction and the crises surrounding factory farming. The Authors enshrine a new methodology for understanding and reversing the pain and cruelty meted out to other species, a veritable cartography they call "pain points". Chapter Ten of God's Country is devoted to "Conservation Biology and Animal Rights: The Case for Immuno-Contraception," a pro-active examination of what would be required to engender a reconciliation between conventional so-called "best biodiversity standards" and a deeper empathy for those countless, luckless non-native mammalian offspring caught in the cross-hairs of human history and migration. The book's last three chapters - "True Conscience, True Civilization," "The Ethics, Economics and Biology of Nations," and a "Coda" all provide suggestions for individually and collectively embarking on a courageous journey towards peace within the world. God's Country: The New Zealand Factor is a stirring call to all those who long for a more humane set of circumstances guiding human collective behavior. Michael Tobias and Jane Gray Morrison have a dream. The beauty of their dream is not only in the imagining, it is in knowing that it could come true. What it would take to make that happen is for a relatively small number of human beings to decide that the world need not spin out of control and that they themselves are powerful enough to help turn what is now a dream into reality, or at least move us all closer to it. God's Country: The New Zealand Factor is a thoughtful, impeccably researched, and deeply moving treatise and more. It is an urgent call to take lifesaving, planet-saving action. The book bursts its seams with enough data to fill any reader's head with provocative reflection for years to come, hopefully for life. It should be seen as a lifeline that can be used to pull Earthlings out of the self-destructive waves of a turbulent sea – a sea that we have churned up as a species, but have the power to calm, if only we think clearly, look through a moral glass, and act quickly before we go under for what could be the last time. In 2008, the British Prime Minister, Gordon Brown, reduced members of Parliament to laughter when, describing how his government had moved to stop the collapse of banking institutions in the UK, he started with the words, "We saved the world. ... " The collapse of banks conjures up the vision of massive icebergs splitting off from their continent and falling with a mighty crash into the sea, setting off all manner of ugly consequence. How much greater a threat is the metaphor of life itself splitting off from all that which sustains it? The melting of the real glaciers, the rising water levels, the probable extinction of polar bears, just for starters, the starvation of seals, the wars for water rights, the famines arising from desertification, and all the other dire consequences of a failure to take drastic action as our planet disintegrates? With only one percent of the oceans, and barely twelve percent of the terrestrial planet set aside against encroachment and destruction, that leaves 87% of the Earth being greatly exposed to harm, its diverse populations decimated, at all the current trends of human impact. There are tens-of-thousands of species at risk, possibly far more given the gaps in science and variations in methodologies for assessing endangered species from country to country. While there are a few "protected" areas at sea, including one of the latest sanctuaries making the Mariana Trench a National Monument, underwater military tests, explosions and drilling, the miles-long trawler nets and congested commercial shipping destroy the hearing and migratory routes of countless Cetacea, interfering with their ability to navigate or survive. Such destruction is but one blow to life among many, and underscores how vital it is to find ways to embrace new thinking and global legislation. What have we to lose when we are already losing almost everything? The authors, Michael Charles Tobias and Jane Gray Morrison, make short shrift of the disturbing and macho idea that caring – for others, the Earth, your own health – is a sign of weakness. With plain and honest argument and stunning clarity, they show not only that to care is a sign of true strength, character, and much more, but also that the survival of all of us depends upon such caring impulses. The authors expose the "survivalist" approach for the anachronism that it is. They painstakingly set out the evidence to prove that clinging to our old, comfortable ways will not save us but destroy us, making the case that if we shake off our fear of change and open our eyes and hearts to the need to sustain, build, and empathize with others – a form of distributive justice – we will indeed survive and prosper. The authors recognize the formidable obstacles and provide incremental blueprints to help us get there. Tobias and Morrison lift the lid on what goes on in places most of us will never enter, from the very bowels of slaughterhouses, to those countless factory farms where animals are raised in pitiful conditions to be slaughtered. Their vivid, even clinical descriptions make it clear that Attila the Hun himself might be moved to shame if he were to consider what our species does to the others in this, the 21st century. Ducks and geese, and billions of gentle and joyful other birds like chickens are kept in dark sheds in wire mesh cages so small that the birds must hold their wings tightly against their bodies, never using them to flap or fly. Geese are force-fed through a funnel so that we can eat their fat-engorged livers in the form of foie gras. The authors examine in technical blow-by-blow analysis the "minimum standards" typically imposed throughout the world by governments so that pork chops can be produced from sows confined to steel-barred cells hardly larger than the size of their bodies so as to prevent them from ever turning around to nuzzle their young, and millions of hoofed animals are converted into fast-food burgers in assembly line hells that have seen little improvement since Upton Sinclair wrote The Jungle in 1906. Throughout God's Country, Tobias and Morrison detail the chilling animal rights issues within a conservation biology context that is extraordinarily serious: here is an ambitious, challenging and constructive overview of the convergence of ethics, science, consumer habits, and overall protection of habitat and species. Where the authors make critical headway is in their relating species and habitat to individuals, with a thorough examination of the options all societies must contemplate if they are to be in any sense of the word, compassionate. Tobias and Morrison relate the consumption of animals from slaughterhouses to all those other millions of species in the world, including baby chimpanzees and elephants torn away from their loving mothers, shackled, and beaten into submission until they perform daft, repetitious tricks that they can't understand but that many people still point out to their children as being fun; the destruction of vast ecosystems with all the creatures therein; the death of fisheries and the excitement shown by fishermen who think nothing of pulling in their catch as if they are engaged in some sort of wrestling match; the looming cumulative loss of more than 50 percent of all biodiversity on Earth if we go on like this for just a few more decades. Few authors have ever linked these two realms – animal rights and vanishing biodiversity – with such painsGod's Country: The New Zealand Factor vii taking ecological analysis and policy recommendations. Few scientists and animal rights philosophers have connected the dots that encompass both habitat and individuals, as difficult as it is in attempting to reconcile so many terrible ethical dilemmas and contradictions. Reading through God's Country (a title rich with devastating ironies), we might well ask how we can call ourselves "civilized" or "the thinking animal" when our factory-farming practices – which we support at the grocery store with every purchase of a chop or wedge of cheese – destroys not only animals' lives but also our soil, fresh water, the atmosphere, and our soul? And ask how can we consider ourselves sophisticated or advanced when, despite our technology, the vast majority of our household products are still tested in ways the Roman Empire would have approved of (e.g., by pouring the latest drain cleaner or nail polish down the throats of rabbits and dogs until they suffer convulsions and die without ever feeling a comforting hand or hearing a kind word)? Then again, Attila the Hun may have had an excuse. Neurologists have discovered that the "mirror neuron," which allows us to feel empathy, may be undeveloped or underdeveloped in some people, such as serial killers and other psychopaths. The point, however, is that the rest of us, can surely find it within ourselves to curb the selfish tendencies that cause us to value personal convenience over caring about others and put short-term gratification over the devastating long-term effects that come from a failure to curtail greed and callousness. Part of the problem stems from sheer ignorance. This book can only help rectify that. Moreover, God's Country exposes the false dichotomies of the idealistic versus the practical, reason versus compassion. Tobias and Morrison persuade us that not only are utopian visions and ideals necessary but that they can be compatible with that which we know, believe, and pray for. By providing blueprints for transcending that false dichotomy – of nature drenched only in blood and brutality – the authors have delineated pathways which highlight the failure of the old desperate view that we must conquer and kill, or at least tame, the natural world and all its inhabitants. This, the authors make clear, is a doomed mindset. They also suggest various compromises that may help in at least getting closer to the ideals, recognizing that "absolutes" are still far from society's grasp. Given what we know now about nature; climate change and rising sea levels; the interests, talents, abilities, needs, and behaviors of other species; the threat of massive migration and death because of desertification; the shrinking of underground lakes; massive pollution of air, waterways, and soil; the disruption of ecosystems globally and so on, to continue to behave as we have been is nothing short of insane. Tobias and Morrison reveal some of the components of that insanity; the destructive forces, moral tensions, global metaphors for right and wrong, the many dark nights of the soul for farmers and industrial agriculturalists and their myriad consumers, and come up with a manifesto for "true conscience, true civilization." All the while they prescribe at least initial pathways that can transcend the violence of the past and help us see how we may reconcile the ethics, economics and biology of nations. We say the right words, and, I suspect, most of us indeed mean them. But how do we translate those good thoughts into action? We might buy "endangered species" T-shirts, donate a little something to a "green" charity to clean a pond, or eat a little less steak, but we are, as the authors point out, "moral schizophrenics." Most of us do not live up to our ideals by a long shot, and we often do exactly the opposite of what we claim to believe (and may, in fact, believe in our hearts). Often, we simply can't imagine how to do it all; to reconcile the countless conflicts in our lives. But does anyone really want to see wars over water, massive famine, overpopulation that robs us of everything – from necessities to wilderness areas – undermining the right of future generations of children to see free-roaming wildlife and inhale without a respirator? None of us, except those with the undeveloped mirror neuron and no conscience at all would want that. Yet, just look around: what do we see? A world of demented video game heroes gobbling up the planet. And by implication, mirroring the reality of humanity's consumption of everything from trees to oil and gas, meat and dairy, taking us ever-closer to a time when there may actually be no tomorrow. In an examination of the relationship between the mass murder of animals for food, and nuclear war, the authors draw poignant Holocaust analogies which are intellectually and emotionally shattering. And their conclusion is absolutely logical: no arguments support the continuation of these self-destructive paradigms; all portents warn against them. There is a classic joke about a patient who believed that he was dead. His psychiatrist tries to convince him that he is alive by pricking him with a needle, as the patient has already acknowledged that a dead man can't bleed. When he sees his own blood, he is surprised. "What do you know," he exclaims, "dead men do bleed!" Isn't this stubborn denial of reality what many of us face every day when we shop, when we sit down to dinner, when we make an unthinking purchase without checking into the product's origin and manufacturer? When we teach our children bad habits, and when we choose our careers – and, in fact, in every facet of our lives in which a multiple of kind choices every day face us as if through a one-way glass? But we are very much alive, even if we are killing ourselves and our planet. We have incredible personal power. We can make decisions that can change the world, increase our own longevity, and set a good example for, and even save those generations to come. And it is not that hard if we set our minds to the possibilities before us and choose to live our lives in positive ways. We need to "de-educate" ourselves – toss out our harmful habits, get out of our heads the insidious commercial jingles that lead us astray – and re-educate ourselves using today's knowledge of everything that is important to us as part of a vast web of interconnected life. Every major spiritual tradition has urged us in this uniformly obvious and inspired direction. We need to heed those elders and learn respect for all others; stop treating other living beings as if they are abstractions, objects, or political tools (how is it that Iraqi civilians' deaths went uncounted for so long, considered to be "unimportant," and how is it that monkeys with electrodes in their heads in laboratories are identified only as numbers)? We need to practice active nonviolence in word and deed. This is an underlying premise of God's Country. The global economic meltdown will certainly not make inspired conservation and animal rights choices any easier, but we can try nonetheless. We need to reach the day when we stop saying, "Respect me, for I am in this narrow category – of an American/New Zealander/woman/human being, et cetera," and start saying, "Respect me, for I am a living being." To ask anything less of ourselves is to shortchange our own worth. We are capable of being far more than robotic buyers of disposable goods, and we are surely more than just the product of tradition and habit. Our intelligence and abilities have lain dormant, poorly and inadequately tested, for so long that we have drawn up those currents that will overwhelm us and our habitat, taking everything else with us. This book presents a challenge to the reader to become a whole, vital, healthy, and energetic participant in life. The authors orient us to our potential, teach us how to maximize the use of our best qualities – imagination, innovation, compassion – and encourage us to extend ourselves beyond our unfocused and meager concerns for our own species. It is extremely interesting that the authors have focused on New Zealand as a test case, a country traditionally thought of as an ecological paradise, Middle Earth. It is certainly a gloriously beautiful country. But, like some other nations, it has also been labeled by many scientists a "capital of extinctions," not to mention the fact that a vast source of its GNP, to date, derives from the exploitation of animals. The authors point to the fact that, consistent with data from throughout the world, eco-tourism to New Zealand is becoming a major revenue earner and this will certainly help refine future economic mindsets, and could be a boon for better animal care and wilderness protection throughout New Zealand. Without pointing fingers or laying the blame, the authors strive with great success to show that it is possible to transform hearts and minds, and for entire economies to entertain new and innovative options that are more compassionate and sustainable than those of the past. Thanks to Tobias and Morrison, the word "utopia" has elegantly slipped into the conversation, and we are given a blueprint for action on a personal, national, and international scale. Who could ask for more?